In medium bowl, stir together pancake ingredients until blended. Pour by slightly less than 1/4 cupfuls onto hot griddle. Cook until edges are dry. Turn; cook until pancakes are golden brown. Stack on serving plates. In small bowl, beat powdered sugar, milk and 1/2 teaspoon vanilla with whisk until smooth. 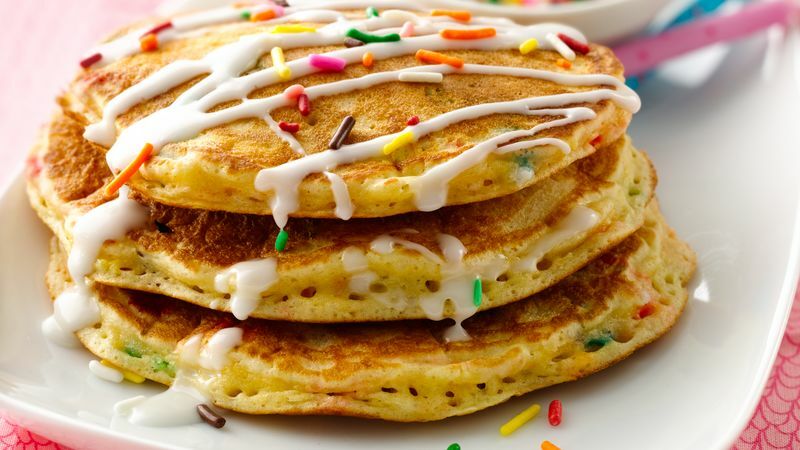 To serve, top each serving with glaze and additional candy sprinkles. These would be a perfect addition to a birthday breakfast table!